West Indies overcame a testing bowling display from Zimbabwe to chase down 142 and seal their first ODI series win in nine attempts. Narsingh Deonarine scored a fortunate 32 to thwart a Zimbabwean comeback following an aggressive start led by Chris Gayle, and backed up an impressive effort with the ball from Dwayne Bravo and Ravi Rampaul that had limited the visitors to a paltry score. West Indies recovered from dispiriting defeats in the Twenty20 international and the first ODI to win three consecutive games and take an unassailable 3-1 lead, marking a positive, though unconvincing, start to a fresh phase under the supervision of newly-appointed coach Ottis Gibson. The legspinner Graeme Cremer put the West Indian batsmen under plenty of pressure, trapping Adrian Barath and Denesh Ramdin lbw and snapping Dwayne Bravo at slip to give Zimbabwe a sniff of an unlikely win. His variations - the googly, the changing trajectory and modifications in pace - proved a handful. 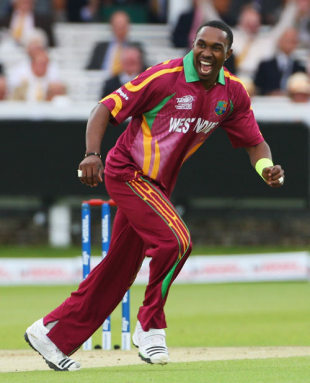 But Deonarine, with some luck - he survived a close appeal for stumping and should have been given out caught-behind when on 16 - guided his team through to the finish with some guarded batting, mixed with pressure-relieving hits through the in-field to bite into the deficit. The required run-rate was never going to be an issue in West Indies' chase, and Chris Gayle was determined to ensure the win was a comprehensive one. Though there was some movement on offer early on, he targeted Elton Chigumbura in the third over of the innings, smashing two fours and two sixes to knock off 22. Chigumbura doled out length deliveries which Gayle promptly punished, cracking the fours over mid-off and the bowler's head, and depositing two sixes - one, a delectable flick over midwicket and the other an unforgiving thump over extra cover. But Greg Lamb - Zimbabwe kept rotating their bowlers - induced Gayle, after being struck for two boundaries, to loft one straight to long-off. When Shivnarine Chanderpaul mistimed an irresponsible pull down midwicket's throat, and Barath and Ramdin followed, Zimbabwe had a realistic chance, but Deonarine's vigil, which took 68 deliveries and included crucial stands of 31 with Ramdin and 38 with Kieron Pollard, deprived them. Zimbabwe's batting let them down again, as they failed to measure up in conditions favourable to pace bowling, exploited to the fullest by Bravo and Rampaul. Gayle, who won the toss, had hoped for some assistance for his pace-heavy attack with some moisture on the track, and the regular flow of wickets that followed justified his call. Rampaul stuck to a tight line, tested the batsman outside off and got the right amount of movement to unsettle the top order. He had disappointed in the ODI series in Australia, proving too expensive, but showed no signs of struggle today. His third ball, one that shot off from short of a length and reared up to Hamilton Masakadza to rap his glove, undid Zimbabwe's most reliable batsman in recent times. If it was the bounce that helped snap Masakadza, some late movement, in his next over, saw the back of Brendan Taylor, as he left a gaping hole between bat and pad to be bowled. The return of Bravo after a thumb injury was timely, and he continued to show his worth. He made an impact with his first delivery, producing an outside edge to snare Timycen Maruma. As the innings began to stagnate, despite Tatenda Taibu's innovative attempts to score, so grew the uncertainty in the running between the wickets, resulting in the run-out of Vusi Sibanda in the 14th over. Bravo kept nagging away at the other end and, to further aggravate Zimbabwe's agony, sent back, in quick time, two players who were the mainstays of their middle order. Stuart Matsikenyeri continued his woeful run, playing down the wrong line to be bowled and Taibu, in a desperate attempt to raise the tempo, played a fatal upper-cut to third man. Chigumbura's arrival at the crease did give Zimbabwe a couple of momentary highs, as he broke a 150-ball boundary drought with a four off Darren Sammy and followed it up with a six above midwicket in Nikita Miller's next over. However, the spinner, too, found the track to his advantage, finding some grip and turn to keep the batsmen quiet and eventually dismissed Lamb, who failed to spot the change in pace and pushed a catch back to the bowler. The wicket had a crippling effect on the innings, as it prompted Chigumbura to buckle down further and postpone a much-needed surge. What followed was another 79 deliveries without a boundary, but Chigumbura tried his best to make amends, beginning the 40th over with a straight drive past Rampaul and sixes in consecutive overs off Miller and Sammy. His fall, though, could not have come at a worse time as he skied a catch to fine leg less than two overs before the batting Powerplay came into effect, and West Indies had taken a major step towards a series win.